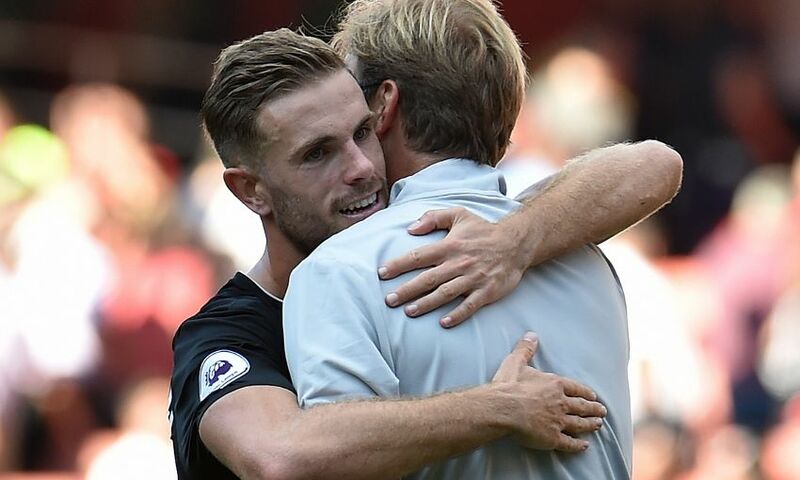 Jordan Henderson wants Liverpool to be 'more street-wise' but nevertheless left Emirates Stadium on Sunday delighted with three points to start the season. The Reds and Arsenal served up a thriller to begin the Premier League campaign, with the visitors running out 4-3 winners thanks to a second-half blitz. The hosts had led through Theo Walcott – who also saw a penalty saved – but Philippe Coutinho’s latest piece of magic from a free-kick levelled the score. When Jürgen Klopp’s team came out after the break, they surged forward and racked up a three-goal advantage via Adam Lallana, Coutinho again and Sadio Mane. The Gunners fought back and threatened to grab a point when Alex Oxlade-Chamberlain and Calum Chambers found the net, but Henderson and co preserved their result. “We came in after the first half knowing we could play better,” the captain told Liverpoolfc.com. “Philippe got us back in the game with a brilliant goal, to come in level. Then the manager said a lot of things we needed to improve on in the second half and I felt we did that. “We came out firing in the second half and got some brilliant goals. They started gathering momentum after their second goal. “There are a lot of things to improve on and work on, but a lot of good things as well. We’ve got to be delighted to come to the Emirates and get three points. “Certainly the second-half performance at times was very good, especially when we went two or three goals in the lead. The pace of Liverpool’s attacking play, the speed at which they moved the ball and opened Arsenal up, was exhilarating to watch for Reds fans. Three of the four forwards in the starting XI scored, with Mane’s blistering run and finish coming on his competitive debut, as they formed an exciting combination. Henderson acknowledged improvements can be made in balancing the desire to attack with a responsibility to defend, but the skipper is pleased as the focus turns to Burnley. He added: “It’s fantastic. The front three and midfield getting forward was brilliant, even the full-backs were getting forward. “Going forward, at times we were outstanding. But we’ve got to be a little bit more disciplined at times, especially myself if I’m playing that role in the team. “There are a lot of good things. It’s hard coming straight off the field and analysing straight away because I’m sure if I watch it from a distance I might pick one or two things we did well that I thought we didn’t, and vice versa.